How to Annotate UML Shapes? Current: How to Annotate UML Shapes? When you want to provide additional information about a shape, or shapes, you may use callout. Callout is a special kind of shape designed for annotation purpose. It enables you to add viewable notes on diagram, which makes it different from other ways of annotation such as comments and post in PostMania. Because callouts are placed on a diagram, everyone can see them when viewing a diagram. This may be good because this ensures that the important notes are being viewed, but this creates problem when a diagram is supposed to be viewed by someone or some parties who are not supposed to read the notes. Let's say you want to add a callout to a business process diagram to ask for a renaming of a business task (shape). While you want the callout be seen by the designer, you definitely don't want anyone else, especially the stakeholders to see it. So when you need to distribute the diagram to these people, you probably want to have the callout hidden in your printout. In this tutorial, we are going to share with you a tips that can easily hide away callout shapes on a diagram. Download Activity-Diagram-Example.vpp. You can also find this file at the bottom of this tutorial, under the Resources section. Open the downloaded project file in Visual Paradigm. Select View > Layers... from the toolbar. This popup a Diagram Layers window. At the top of the window, click to create a new layer. 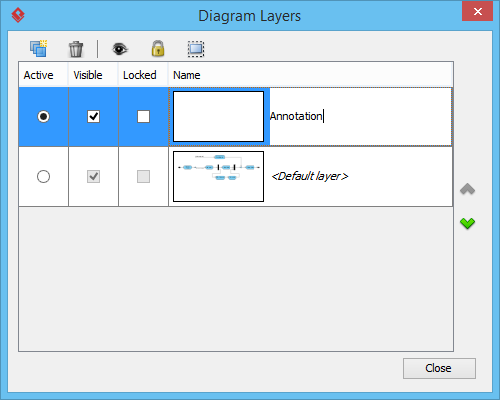 Enter Annotation as the name of the new layer. Click Close to confirm and return to the diagram. 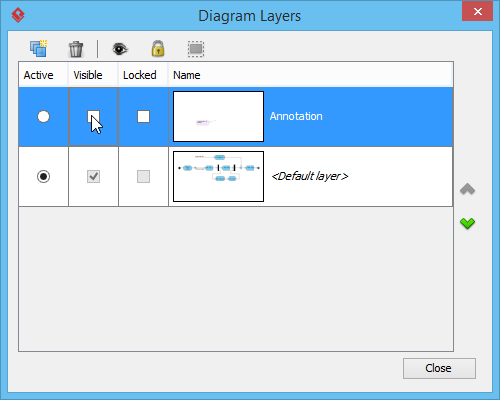 The newly added layer is automatically set as the active layer. Shapes to be created will be put in this layer. Now, start creating the callout. Select Callout from the diagram toolbar. Click on the diagram and enter Check Payment is not needed as the content of callout. Make the pointer points to the Check Payment action. Open the Diagram Layers window again. Uncheck the checkout in Visible column for the Annotation layer. You will find the callout hidden in diagram.